I’m not saying that you need Cottonelle. I’m not even saying that you should be using Flushable Wipes because that would be rude and intrusive and might imply that your personal care habits are sub-par. I would never say that to you. However, if you’re reading this and thinking Puhleez I don’t need wipes I’m an adult and toilet tissue has been fine my whole life and I’m not gonna change then maybe it’s time to just give some consideration to adding a little something to the regimen. Toilet tissue alone is sort of like washing your car without any water. 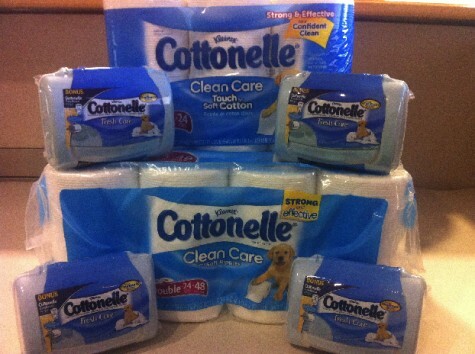 The folks at Cottonelle are giving away a two month family supply of products to one of my readers. It includes Contonelle Clean Care (12 Rolls), Contonelle Clean Care (24 Rolls), and 4 Cottonelle Fresh Care Wipes. I’ve made it super easy for you to enter. Good luck! If you’re looking for a giveaway with a little more value go to Cottonelle and enter to win a $10,000 bathroom makeover. Dishes. You can’t wash dishes without water. I can’t tell you why but I am ALWAYS buying TP, so I’m in. Argh. I forgot to get the dog washed today. i need water to clean my car! I need this. All of it. We are constantly running out of all paper goods in my house! Can’t was dishes or laundry without water! The puppies paws of mud!!! I can’t give myself a bath without water!